Each examination book contains eight sheets that are already stapled together at the side. Each sheet is wide-ruled on both sides and has a margin. The cover offers preprinted areas for name, subject, class, section, instructor and date. 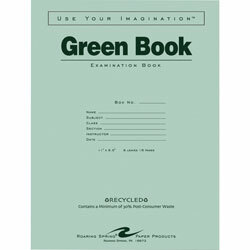 Students fill out the pages and turn in the entire book for precise test-taking. Paper contains 30 percent post-consumer material. Cover is made of 50 percent recycled material with 30 percent post-consumer content. Green Ruled and Subject Notebooks from Roaring Spring Paper! 588 In Stock today.